We focus on Louisiana cases in Personal Injury, Class Action Lawsuits, Malpractice, Mass Tort, Maritime Injury, and Securities Fraud. Example of Large Jury Verdicts - " Jan. 2007 - 330 Million Award Approved for Environmental Oil Damage " - To Read about some of the largest jury verdicts in the United States, please review our website. 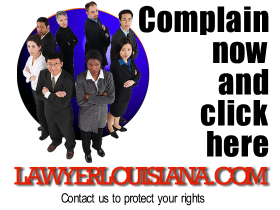 read more To make a complaint now, please click here to contact a Louisiana Licensed Attorney & Our Legal Team. ALERT - Merck agrees to $4.85 billion settlement over painkiller Vioxx. Ask our lawyers and attorneys to help by submitting a contact form. Medicine Induced Injury Complaint Form etc. Wrongful Death of Loved One Stroke Heart..
2007 - A federal judge in New Orleans approved a $330 million class action settlement between Murphy Oil Corp. and residents of a New Orleans suburb flooded by crude oil during Hurricane Katrina. G. Mentz, JD, MBA, Atty at Law . - Mentz Law, LLC - 200 L & A Road, Suite B, Metairie, LA 70001 - 504-495-1748 www. Kglg .com "The hiring of a lawyer is an important decision that should not be based solely upon advertisements." This site intended of Louisiana citizens. G. Mentz, Esq. is a licensed attorney in (LA) Louisiana and the United States Federal Courts of EDLA. Your review, consideration, contribution, or exchange of information on the KGLG.com website does not create a lawyer-client relationship between you and Kahn Gauthier Swick, LLC. The information that follows explains how you can become a client of the Kahn Gauthier Swick, LLC. Kahn Gauthier wants to become your comprehensive online legal solution. Soon we will offer you solutions online to many of your legal needs, conveniently, securely, and economically. Our goal is to offer you access to attorneys with substantial experience and success in their practice field, attorneys that put the client's interest first. We want you to be able to come to one source online, Kahn Gauthier Swick, LLC, for your legal needs with complete confidence. Here is how an attorney-client relationship can be created between you and Kahn Gauthier Swick, LLC. You provide us information about a specific problem or claim you feel you may have through one of the site links for cases in which we are accepting claims, or by email or telephone. The Kahn Gauthier Swick, LLC will evaluate that information and inform you by email whether we are willing to represent you in the specific matter you have presented to us. If either the Kahn Gauthier Swick, LLC or you do not agree to create an attorney-client relationship, none will exist. An agreement to represent you in a specific matter does not obligate us to represent you either generally or in any other specific matter. The Kahn Gauthier Swick, LLC will keep confidential the information you provide when you ask us to evaluate a possible claim or other legal problem, to the same extent that such information would be confidential if an attorney-client relationship actually existed between you and Kahn Gauthier Swick, LLC. The information will remain confidential even if we do not both agree to create an attorney-client relationship. The Kahn Gauthier Swick, LLC will respond with reasonable promptness to your inquiry, and all information in our response will be accurate. If you become a client of Kahn Gauthier Swick, LLC, we will represent you zealously, competently, and diligently. We will keep you informed of the progress of the matter in which we are your attorneys, and we will respond to your reasonable requests for information about it. We will be loyal to you and put your interests first. We will not represent anyone who is opposed to you in the same or an substantially related matter. We will keep confidential all information relating to the representation, unless you consent to its release. Information that is generally known, such as a listed telephone number, is not confidential. We will use your confidential information only to advance your interests in the matter in which we are serving as your attorneys. We do reserve the right to reveal confidential information (1) if we believe it is necessary to prevent your committing a crime that is likely to result in death or substantial bodily harm, (2) to establish a claim or to defend the Kahn Gauthier Swick, LLC and its lawyers in a controversy with you, or (3) to respond to allegations about how we have represented you. The Kahn Gauthier Swick, LLC encourages its clients to take advantage of the information service offered on KGLG.com and to participate in its Community Bulletin Boards. Your doing so, however, is not part of our attorney-client relationship and remains subject to the Terms and Conditions http://www.kglg.com/policy/mini_policies.asp#terms and Privacy Bill of Rights http://www.kglg.com/policy/mini_policies.asp#privacy applicable to that service. Below is the disclaimer for the owner of the site. Verdicts on the website are used to notify persons in the US regarding national litigation and are only examples of class actions or large jury verdicts for law firms around the country. These examples are not used to imply the possibility of recovery but as information about particular cases in various specialties that may be of interest to viewers.